With awards shows (SAG, Grammy’s, Academy, to just name a few) and BIG football games on the horizon some people will be hosting little gatherings to watch these events. Appetizers are a favorite food to nibble on while sitting around the TV. One bite appetizers with a toothpick are the perfect appetizer for such occasion. My father-in-law saw these and requested they be made for our Christmas Eve appetizer. 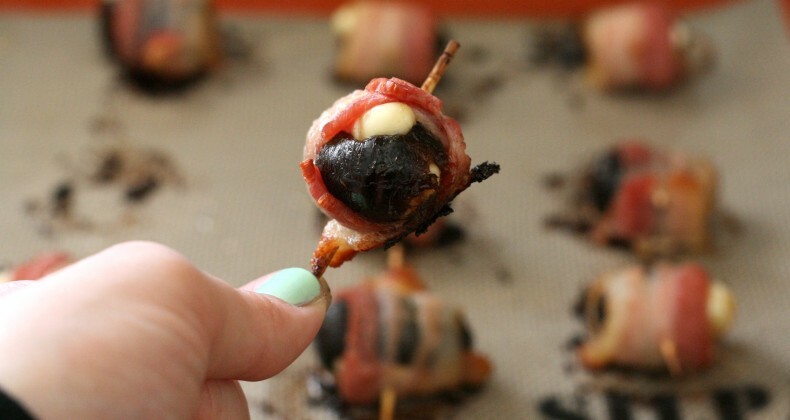 I had never heard of devils on horseback and the combination of bacon and prunesÂ intriguedÂ me. Unfortunately my family caught a stomach bug right before Christmas so I didn’t make these, but I couldn’t get the idea out of my head. Some things you just don’t plan. I opened the fridge and saw I had some leftover bacon and a little bit of Brie. 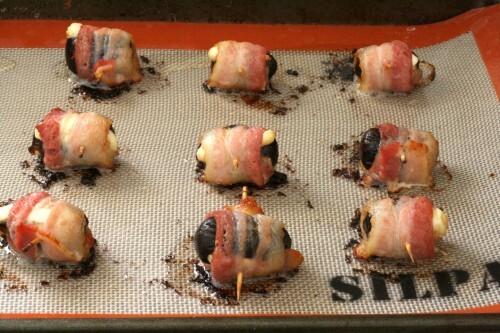 Both of those ingredients screamed devils on horseback! As you can see I used pitted prunes. There are a few variations of these delicious bites. Some use pitted dates, some use prunes. Traditionally, at least according to Wikipedia, dates are stuffed with mango chutney and wrapped in bacon. Sounds delicious, right? Others make them with prunes and stuffed with bleu cheese (mmmmm!) or almonds and wrapped in bacon. I took someÂ libertiesÂ and went with prunes, Brie, and bacon. The results were WONDERFUL! Find the hole where the prune had been pitted. Insert a small piece of cheese. Wrap in half a piece of bacon and secure with a toothpick. Easy to make a little or a lot. 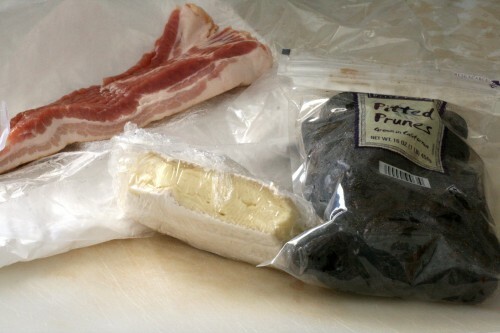 Crispy salty bacon + gooey Brie + sweet prunes = A wonderful sweet and savory treat! Do you host an award party or a Super Bowl party? What are your favorite appetizers? 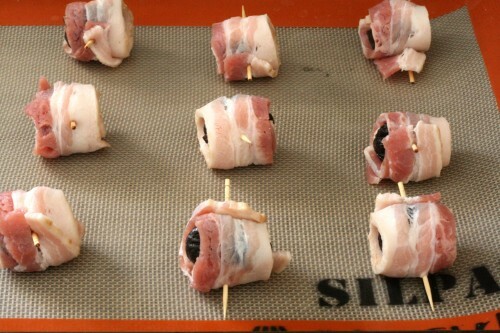 Stuff the prunes or dates with a little bit of cheese then wrap in a half a pice of bacon. Secure with a toothpick. Bake for 20-25 minutes or until the bacon is crispy.